Cycling is a mode of transportation that’s growing in popularity and relevance in our Green-Oriented world. Worldwide, the numbers of commuters forgoing motor vehicles and switching over to bicycles are increasingly growing. While riding a bicycle is a healthier alternative when compared to driving or taking a bus, due to it’s difference in physical activity, the poor air quality in urban settings contradict the benefits. Heavy traffic spews toxic gases and many fine particles which will then enter our respiratory tract eventually. Aerial pollution causes both short and long term damage to our lungs and the upper respiratory tract, therefore, cycling under these conditions will pose problems in the near future. In order to ride safely without inhaling these harmful particles and gases, a protective mask that is capable of filtering the air you breathe is the best solution. An ideal mask for cycling incorporates a number of considerations, specifically for cycling, to ensure it’s effectiveness. The selected mask should form a tight seal on the user’s face, so as to make sure the air he/she is breathing, will only get in by passing through the filters. The filters must be capable of keeping microscopic particles and noxious fumes, out of the user’s mouth and nose. Wearing the mask shouldn’t inhibit the breathing of the user during vigorous activities, nor should it cause any discomfort to the user. Cyclists will need to breathe harder than pedestrians, high resistance masks (those that are best for filtering the air) increases the strain on the lungs. An ideal mask for riders will be something that balances between both filtration power and breathability. During a cycling workout, blood is pumped vigorously through our bodies and heat is generated. A mask that traps heat is a major problem, it reduces the intake of oxygen and compromises the ability to breathe easily. Unfortunately, most masks on the market are “heat-traps”. After a long ride, the mask will be sweaty, damp and dirty, the last thing you would want is to reuse such a mask on your next trip, not knowing what kind of bacteria will be growing in it. The filters should be quickly replaceable and the mask itself should be easy to disinfect. For cyclists, being able to mount and dismount the mask quickly is critical. While riding in traffic, the rider should be able to remove the mask singlehandedly with a single motion and vice versa, to minimize distraction and lost of time. Weight is also another important factor to consider, anything heavy or cumbersome will only make the ride laborious and difficult. Ultimately, the most important factor for commuters, is the cost of the product. For those who rides and needs a mask daily, the masks and it’s filters should be reasonably priced and easy to come by. Other neoprene masks, like some cyclist-intended masks, are heavy duty equipment that digs a hole in your waller. In addition, they are heat trappers and turn smelly quickly, yet difficult to clean. All the more so, it is larger and troublesome to carry around. It is a product designed for professional looks, but it would be a little too much for a daily user. While there are a mountain of masks out there, all offering a range of protection, comfort and price, only one provides the balance between the factors that best benefits the user, TOTOBOBO. Our mask is specially designed and moulded with a unique material that allows the user to custom fit the mask to their face, help firmly onto the face by a pair of ultra elastic and flexible straps. The straps are made from elastic polymers and is friendly on the skin. One mask fits all and it can be folded up when not in use, comfortably keeping it inside our pockets. The Totobobo Mask forms a snug seal on the user’s face, ensuring air to only pass through by the filters. Unlike other masks, the Totobobo Mask is a master in both high airflow and filtration. The patented body valve design allows low resistance exhalation so that you can easily take in clear air with each breath. Most protective masks need to be professionally checked for a proper seal, it is time consuming to do so as well, whereas the Totobobo Mask’s seal can be easily clarified in a short period of time. Both children and adults can get a good fit with it. Our filters are European designed and of the finest quality, capable of keeping out particulates as small as 0.1 microns. Using static electricity to snag the particles while they enter the filter, the Totobobo Mask keeps out all the toxic particles produced from motor vehicles, industrial exhaust, cigarettes, wood fire and charcoal fumes and also incense smoke. Biological components such as pollen , mold pores, dust mites and cockroach allergens, dust and common soil particles, can be filtered out as well. The mask is anti-viral thanks to Biocote, a silver-ion anti-microbial agent, and important property to be taken into account when heat and humidity of the mask’s interior is involved. This way, you can further ensure the cleanliness and safety of Totobobo Masks. The mask is also easy to disinfect using soap and water. 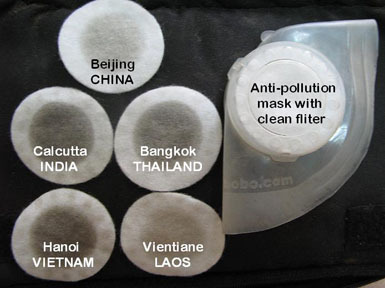 Best of all, the entire mask is reusable, all you have to do is to replace the old filters with a new pair and you’re good to go. As for being economical, the Totobobo mask can not be beaten when it comes to the bang for your buck. Compared to leading competitors on the market, our masks are unparalleled when it comes to value. As the chart indicates below, the Totobobo Mask is more cost effective than any of the leading alternatives, same goes for the replacement filters! Cyclists worldwide swore by the effectiveness and usefulness of the Totobobo Mask when it comes to riding in inclement environments. Here are some testimonies of a few elated users from around the globe. 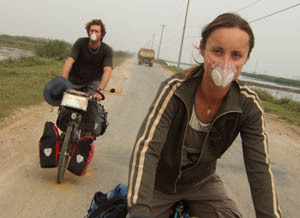 Herve and Goska appreciated the high quality of respiratory safety they enjoyed by using the TOTOBOBO mask on their journey. When they lectured to students along their trip about air pollution awareness, they also informed them of the TOTOBOBO mask�s unmatched quality and value. Choose Totobobo for Safe Cycling! 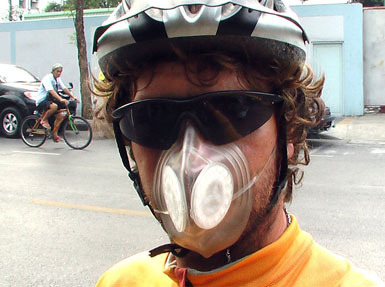 Around the world, across the globe, cyclists are adding another item to their must have list, apart from protective gear, they added in the pollution masks. If you’re looking for one, don’t hesitate to try out our Totobobo Masks!